Hobo Code Get's More Air! How cool is this: we get back from a road show - absolutely buzzing from the potential of our endeavors. We find that the stories of hobo code resonate through the generations - young, old, and in between. The general overall buzz is that the story is worthy of the attention and interest. We sold porch flags sets, patches, Tshirts, decals and more. We heard stories, shared stories, and found connections on so many levels. Most common was the appreciation for Americana history and the notion of unique communicate with etched, sketched, or chalked symbols. Needless to say, we've tapped into something that is reaching into the hearts and minds of many. Stay tuned for more - following the hobo code trend is going to be fun! 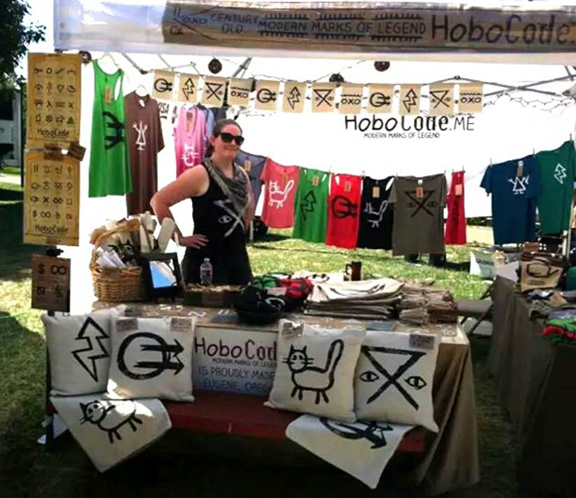 Posted on September 1, 2014 by Hobo Code and tagged hobo code americana road show trending history.